Halloween is right around the corner! Whether you are planning on participating in the spookiest night of the year —Halloween — it is likely that people in your neighborhood are. This means that the streets will be filled with loud noises, new faces and all manner of things that can stress out your four-legged friends. Thankfully, you can prepare yourself — and your pets — for the big night with the following simple safety tips. When ingested, candy, sugar and chocolate, in all forms, can be dangerous for your pets. Nowadays, most candy also contains artificial sweeteners, such as xylitol, that your pets are unable to digest properly. That’s why it is important to keep your Halloween candy away from your pets and avoid storing it anywhere your pets could easily or accidentally find (and eat) it. Candies wrapped with plastic or lollipops can also be a severe choking hazard for pets, large or small. Swallowing candy wrappers or similar foreign bodies can cause an obstruction in your pet’s digestive system that is both expensive and painful to remove. If you believe your pet has eaten candy or chocolate, contact us or call the ASPCA Animal Poison Control Center immediately. In fact, it is best to keep all Halloween decorations out of your pets’ reach. Decorations with wires or other small parts and jack-o-lanterns that involve the use of small candles should not be accessible by pets. 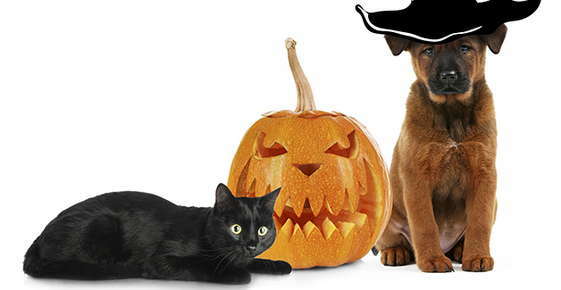 Easy access can encourage pets to chew or play with loose wires and makes it easy for them to knock over lit pumpkins or candles and injure themselves, or even start a fire. On a night like Halloween, tension and excitement is at an all-time high. When opening the door to visiting trick-or-treaters, take care that your pet does not make a run for the door and dart outside. If, for any reason, your pet does escape and become lost, it will help if your pet has proper, and updated, personal information. Make sure you have armed your pet with a collar, tags and/or a microchip to improve the chances he or she will return home safely. "Fabio wasn’t eating the food I was giving him and I didn’t feel he was getting the nutrition he needed. Thanks to Dr. Anderson, he evaluated Fabio and his current diet to make some recommendations and now Fabio has gone from barely eating to finishing his meals and he looks healthier than ever. You clearly are an expert in your field...thanks so much!"